The clock is rapidly winding down on the 2014 Continental Tire Series Championship, and for the Virginia-based BMW aftermarket and tuning specialists at BimmerWorld, a chance to race at home in front of loyal fans, friends and customers at Virginia International Raceway comes at a perfect time in the season. Locked in a heated battle for the Street Tuner Championship with BMWs built and developed at their nearby base in Dublin, VA, BimmerWorld owner/driver James Clay says racing with plenty of support on home soil can only help the team’s Championship efforts. 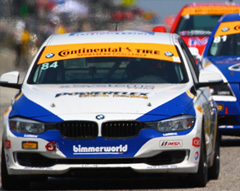 BimmerWorld’s Greg Liefooghe and Tyler Cooke have led the ST Championship this season in the No. 81 BMW 328i, and sit within striking distance of recapturing the lead before the season finale in October. As evidenced by the strong team showing at the previous round at Road America, BimmerWorld’s entire four-car program is focused on helping the No. 81 to take the ST crown. The team will have one change to its lineup this weekend as BimmerWorld’s race-winning driver Dan Rogers steps out of the No. 82 BMW 328i he shares with Seth Thomas to handle fatherly duties away from the track. Despite losing his wingman for the event, Thomas is confident Colburn, who filled in for Rogers at a previous round, will help maintain the No. 82’s momentum. Clay’s rookie teammate Jason Briedis has also had a significant learning curve to deal with this year, yet has been driving with the pace and poise of a veteran at recent events. Making the transition to pro racing with BimmerWorld after earning his stripes with the team in amateur events has clearly paid off for Briedis, and with a chance to race at a familiar track, he expects to add more valuable experience in the turbocharged No. 84 BimmerWorld BMW 328i.